When your monthly financial budget is tight, meal planning and grocery shopping can be challenging. For many seniors who are on a fixed income and need to watch their overall expenses, eating healthy on a set budget can be tricky. Plan Meals Around Store Sales: Many times, healthier food options cost more. If your local grocery store offers a savings or loyalty card, be sure to sign up and check the weekly circular to see what’s on sale. Instead of shopping for groceries based on your weekly meal plan, consider planning your meals around what’s on sale. Make a Grocery Game Plan: Making a grocery list before heading to the store can help you stay organized, save money (and time), and choose more nutritious options. Cut or Download Coupons: Use paper and digital coupons on the things you buy most to help you save money. If you see coupons for items that rarely go on sale, consider buying those items even if you don’t need them right away. Check Out Store Brands: Typically, a grocery store brand cost less. These products are made under a special label, sometimes with the store name. You might have to look on shelves that are higher or lower than eye level to find them. And these often taste just as good as the name brand! Buy in Bulk: Of course, only buy what you can use before it goes bad, but if you buy meats or seasonal fruits and veggies in bulk, freeze them. Freeze what you’re not going to use immediately into portion-sized packages and thaw as you need them. Buy Economical Produce: Bananas, apples, oranges, cabbage, sweet potatoes, dark-green leafy vegetables, green peppers, and regular carrots are typically the most inexpensive fruits and veggies at your local market. Fresh fruits and veggies also are nonprocessed, healthy options. Incorporate Variety: Consuming a variety of foods will ensure you’re getting all the nutrients you need. According to the National Council on Aging, a healthy meal should consist of a lean protein, fruits and vegetables, whole grains and low-fat dairy. Remember Your Liquids: As you age, your sense of thirst can decrease. To combat this, MyPlate, a healthy eating initiative by the U.S. Department of Agriculture, suggests drinking plenty of water throughout the day to stay hydrated even if you don’t feel thirsty. Water is best, but fat-free milk and 100-percent juice are other nutritious options. Consider Outside Support: Some seniors fail to get adequate nutrition simply because they don’t want to bother with grocery shopping, preparing a meal and cleaning up afterward. 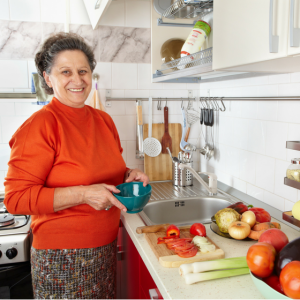 Hiring an in-home companion caregiver can assist you or your aging loved one with grocery shopping, preparing regular meals that maintain a healthy diet and provide sufficient nutrition, and by simply adding joy and comfort to one’s day. How are you keeping your healthy eating habits, even if you’re on a tight budget? Share your tips and suggestions on our Facebook page. If you have specific questions about caregiving or meal planning for specific dietary needs, please reach out and Ask Our Nurse. Diet is something everyone who is aging either discusses too much or avoids it entirely. Whether it is breakfast, snacks, lunch or dinner, taking care of not taking too much and not even too little is a balanced one has to strike while dining. This is a great list of tips. Very helpful.